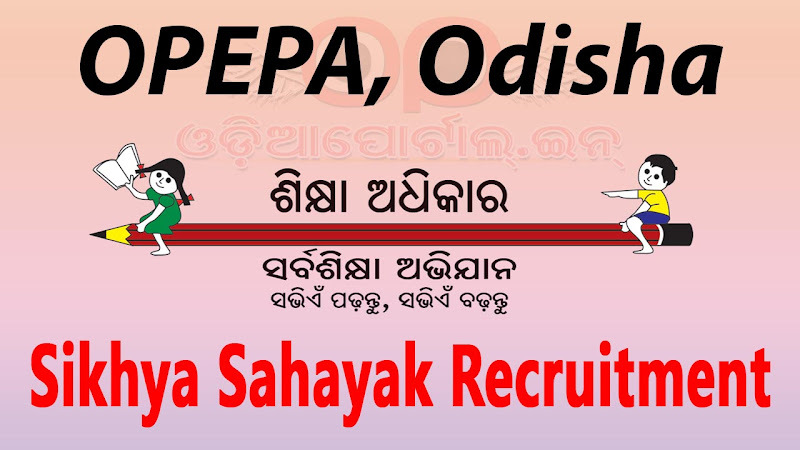 Odisha Primary Education Programme Authority or OPEPA has published advertisement for Recruitment of "14087" Shikya Sahayak or Odisha Government Primary & Upper Primary School Teacher Posts. The Online Recruitment process is going to start from 20th January, 2017. The following is complete Guidelines for Sikhya Sahayak Recruitment 2017. Government will fill 14087 Sikshya Sahayaks posts during 2076-17. Of these vacancies, 50% will be filled up by the candidates having qualification of Higher Secondary with CT (Dl.Ed) and rest 50% will be filled up by the candidates having Graduation with B.Ed. 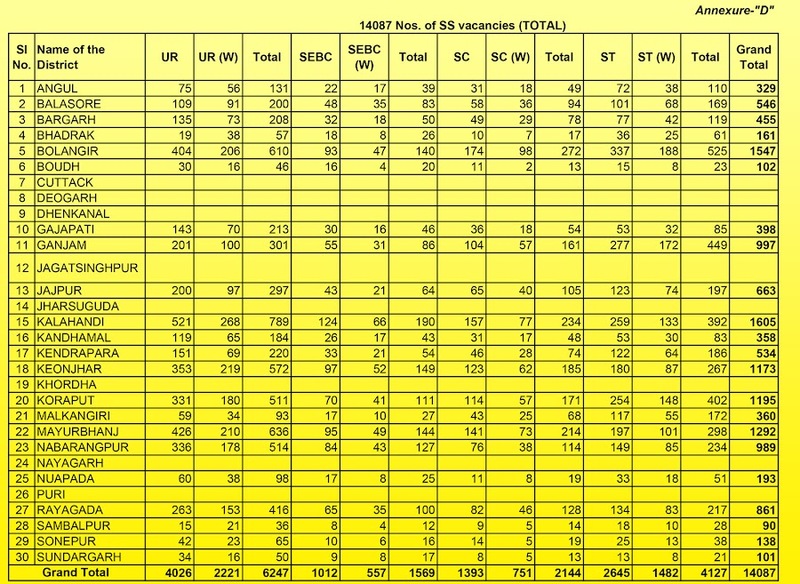 in each category, 60% of vacancies will be filled up by the candidates having Science (+2 Sc./+3 Sc.) and 40% will be filled up by Arts/Commerce (+2 Arts or Commerce/ +3 Arts.) background. The candidates may give option up to 30 districts in order of preference, wherever vacancies are available. Passing of required training and the score in OTET mandatory for all candidates. Selection list shall be prepared & will be valid for 100% of the vacancies of the districts. The maximum age limit shall be as per the guidelines for engagement of Sikshya Sahayaks i.e. 32 years for UR candidates with relaxation of 05 years in case of SC, ST, Women, ex-Servicemen and SEBC candidates and 10 years in case of PwD candidates as on the date of publication of the advertisement. Higher Secondary (+2 or its equivalent) with at least 50% marks and 2 year Diploma in Elementary Education (CT). Graduation and 2 year Diploma in Elementary Education/ 2 year Diploma in Special Education. Candidates must have Odia as MIL up to Class-X or pass in Odia language test equivalent to Matric standards conducted or declared equivalent by Board of Secondary Education, Odisha except the candidates as mentioned below. Graduation with at least 50% marks and 1- year Bachelor in Education (B.Ed.). Higher Secondary (+2 or its equivalent) with at least 50% marks and 4 - year B.A. B.Ed./ B.Sc. B.Ed. Candidates must have Odia as MIL up to Class-X or pass in Odia language test equivalent to Matric standards conducted or declared equivalent by Board of Secondary Education, Odisha except the candidates as mentioned below.. In order to be eligible for Urdu, Bengali, Telugu Sikshya Sahayaks, candidates must have passed Urdu, Bengali, Telugu as the case may be as MIL up to HSC standard. Since their engagement is likely to be held in the bilingual schools, such candidates shall produce a certificate from the Head Master of the concerned schools to the effect that she/he has passed HSC examination in Odia medium. Candidates can apply either in Category-1 or in Category-2 as per their qualification. The Sikshya Sahayaks shall perform the following duties. Teaching in the school shall be the main duty of the Sikshya Sahayaks. They must maintain regularity and punctuality in attending school. They must ensure completion of entire curriculum within the specified time. They must assess the learning ability of each child and accordingly supplement additional instructions if any as required. They must ensure minimum level of learning (MLL) for the students as prescribed by the Competent Authority (School & Mass Education Department). They must ensure at least 90% attendance of the children in respective schools in all classes. They shall reduce the dropout of the children in school. They shall motivate the parents / guardians of the village in which Primary School is situated for enrolment of children within the age group of 6 to l4 years. lt shall be his/her duty to contact parents / guardians in case children fail to attend classes regularly and get back such children to the classes. They will hold regular meeting with parents and guardians and apprise them about the regularity in attendance, ability to learn, progress made in learning and any relevant information about the child. They shall perform all such other duties as assigned to them by the competent authority as and when required. They shall abide by the rationalization of teachers policy of Govt. as issued from time to time. Head Pandit /Head Master or Head Mistress in charge of the school to which he/she is assigned. They shall perform the duties as will be entrusted upon him/her by the concerned Head Pandit /Head Master or Head Mistress. ସବୁ ବିଷୟରେ ସୂଚନା ଦେଇଥିବା ଯୋଗୁ ଆପଣଂକୁ ବହୁତ ବହୁତ ବଧେଇ ଜଗାଉଛି, ଭଗବାନ ଆପଣଂକର ଵେବସାୟ କୁ ଅଗ୍ରଗତି କରନ୍ତୁ. ମୁଁ st category ର ଏବଂ otet-1 qualify କରିଛି ,କିନ୍ତୁ ମୁ untrained candidate. 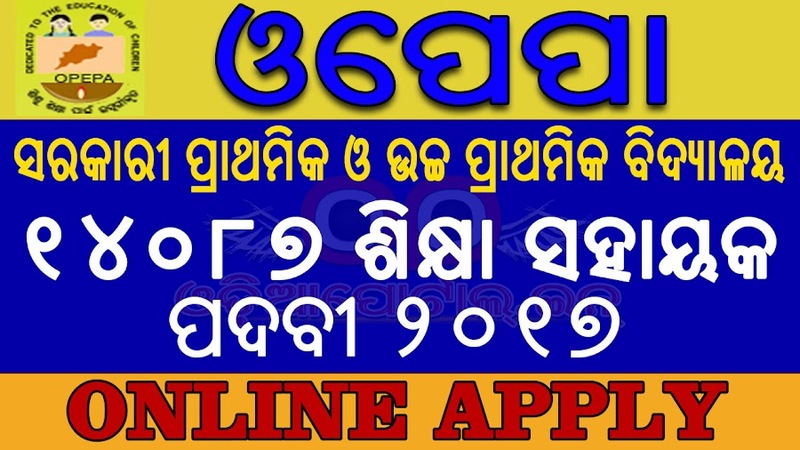 ss apply କରି ପାରିବି କି? i am belongs to sc. and untrained candidate. i am belongs to sc caste. and untrained candidate and also qualify otet exam 2017. can i apply for this post. Can a untrained SC science student apply opepa? in case of TGT appointment (PCM/CBZ/ARTS ) THE AGE LIMIT SHOULD BE 48 YR FOR QUALITY EDUCATION. Sir I am sumanta i have passed otet paper 1 but I am untrained candidates can I apply this ss post.. But in 2016 recruitment process my application number is not found.please give me my application number for this recruitment process. Dear sir final list kebe asiba..? when & where kalahandi district ss counseling?